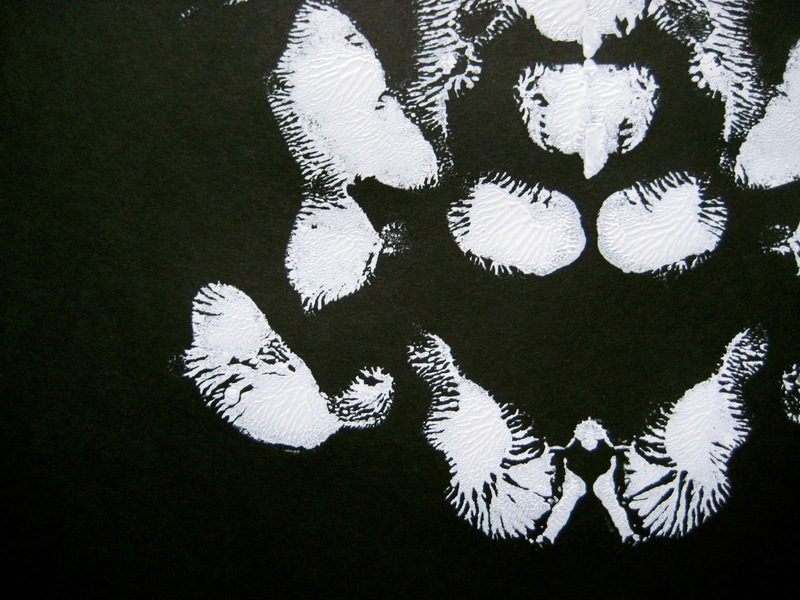 I've been thinking a lot lately about the clean graphic quality of Rorschach prints. That's not weird, right? I know the inkblot test has largely fallen out of fashion in the psychiatric community, which is probably for the best since they do seem a tad pseudoscientific. 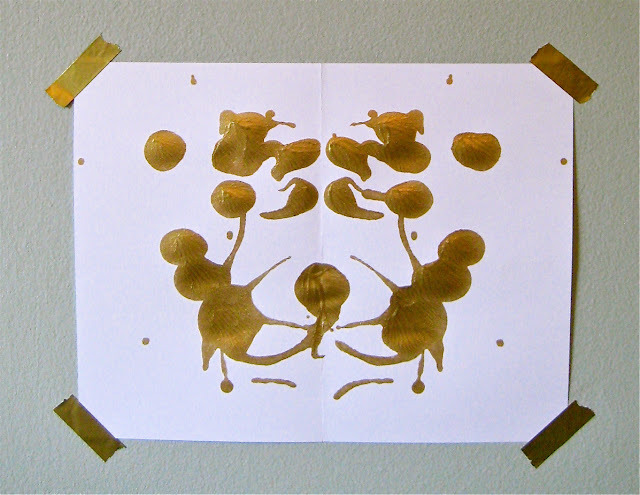 But Rorschach's original prints are really quite beautiful nonetheless. And our tendency to assign meaning to patterns in an attempt to make sense of random shapes (an example of Pareidolia) is really pretty cool. Window to the brain! 1. 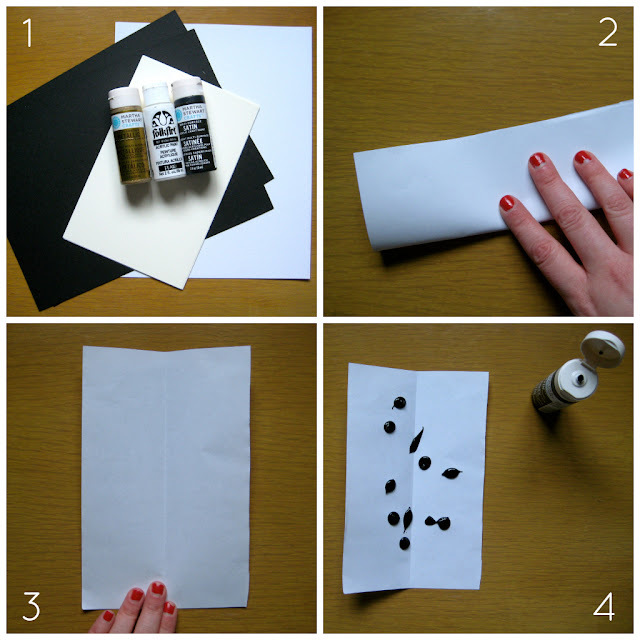 Paper and paint: that's all you need. Cardstock holds up best to the paint. I wanted to try the classic black on white as well as the reverse. And I threw in gold because gold on white looks bomb. (As we all learned from the dust-jacket of Jay-Z's biography, Decoded.) 2. Fold the paper in half length or width-wise. This makes it easier to fold once you add paint. 3. Unfold paper. 4. Squeeze drops, swirls, or spatters of paint onto the paper. 5. 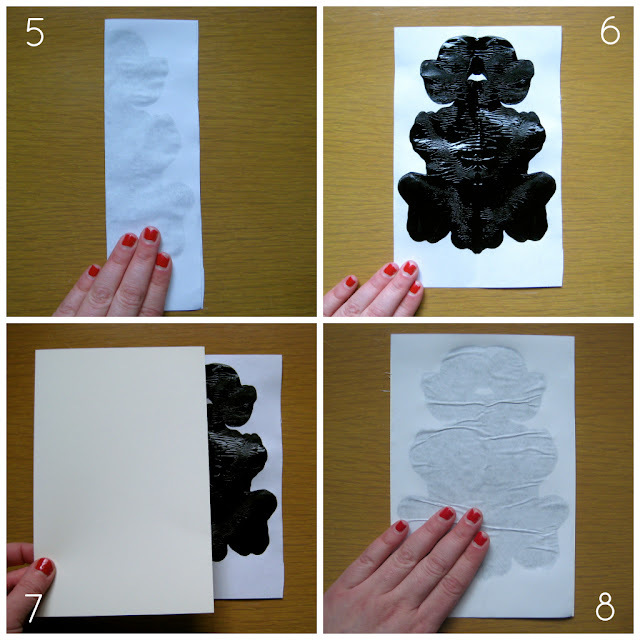 Fold the paper in half again and smooth to distribute paint. 6. Unfold the paper carefully. Now, you can stop here and call it good. Your print will have a crease down the middle, but it still looks pretty cool. 7. Or you can use your first print as a stamp and place another paper on top. 8. Smooth over the paper to evenly distribute the paint. 9. Peel the first paper back from the second. 10. Very carefully. You can see the difference between the two prints. The one on the left is the original and the one on the right is the print made from the original. Darker, thicker coloring vs. more detailed, lighter paint. Two monsters: one a little Darth Vader goblin, the other a little Creature from the Black Lagoon. * All depends on your preferences. There you have it. 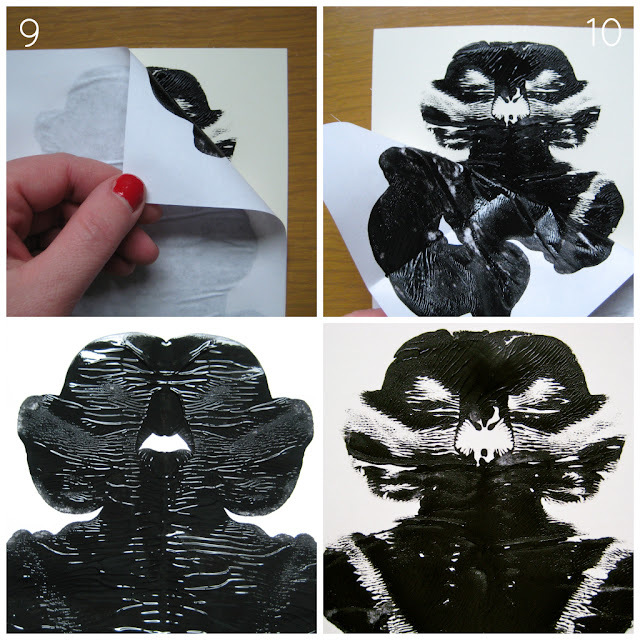 Whether you want to fill your wall with pelvic girdles and skull faces, or demon butterflies and masked assailants (I am going to the mental institution), Rorschach-style prints are the way to go. And just think, if you don't want them watching over you while you sleep, you could always break them out for Halloween. Now, what do you see? *The "two monsters" line caused a total Shakespeare flashback. The prologue to Romeo & Juliet, to be exact. You know: "Two households, both alike in dignity,/ In fair Verona, where we lay our scene,/ From ancient grudge break to new mutiny,/ where civil blood makes civil hands unclean." Before you go thinking I'm getting all smarty pants on you, please note that if you've seen the Baz Luhrmann adaptation (which I have about a thousand times), there's no way you don't have the first lines of Romeo & Juliet memorized.